The legend tells that Noah upon the end of the Great Flood, sent out from the Ark several birds to verify the status of the earth. As it is known, he sent out a crow then a dove but little is said about another much known bird, the common kingfisher. Once this small birds was of a grey colour but was endowed with courage and strength so that, as soon as freed it flew in the air rising higher and higher looking for the sky and the sun that had been obscured for such a long time. That is how, risen too high, got painted its rump of the bright light blue of the sky and the chest, burnt by the proximity to the sun, of a wonderful brick colour. Many are the legends and the traditions linked to one of the most coloured and cute birds of our winged world. The Common kingfisher or Halcyon (Alcedo atthis Linnaeus, 1758) belongs to the order of the Coraciiformes and to the family of the Alcedinidae, only member in the European avifauna, a group that includes birds present all over the world with very lively and particularly accentuated colours. The main legend that since always accompanies this small bird is the one that led later on to the origin of its scientific name. In the Greek mythology it is related of a woman named Alcyone, daughter of Aeolus, king of the winds, and of her man, Ceyx who, gone on a sea voyage, drowned in a shipwreck. Faithful wife, every day she was going to the beach where she had left him hoping to see him back but the waves took back to the beach only his remains. Desperate, throws herself into the waters drownng but the gods, moved by her act, transformed her body and that of the husband in two kingfishers. As a matter of fact, Halcyon or Alcedo and Ceyx are now the name given to some genera to which are assigned these birds. Going on then with the legend, it seems that these birds nidify very close to the sea and their nest was continuously destroyed by the waves, whereby the gods intervened appeasing the waves for seven days before and after the winter solstice, so that they might reproduce. These days are called halcyon days and ideally represent a happy period. Mutatis mutandis, all the days when the sun shines and the sky is clear, are still now called halcyon days. To this birds are linked also more popular traditions. It was told that to keep in the pocket a dried-up body of kingfisher preserved from lightnings whist is kept in a closed space, would keep away moths and insects. Finally, a last reference dedicated to the nobility heraldry. The kingfisher in the blazon arms, identifies the fourth son of a lineage, with a clear reference to the very reduced length of its small legs. It was said, in fact, that the fourth son did not have legs sufficiently long to cover the necessary steps for reaching the hereditary rights of the first-born. The kingfisher is clearly linked to the aquatic ambient and only rarely, during its short seasonal wanderings, gets away from these places. It may be seen passing rapidly close to the surface of the water heralded by an unmistakable ultra-tonal trill but more than for the sound it is recognizable by the wonderful light blue of its wings. A bright arrow that in an instant crosses your visual field. It will be well flashing but the bright turquoise of the caudal cover and the orange chest cannot go unnoticed by any look. As for Alcedo, the scientific name atthis comes in its turn from the Greek mythology and identifies rightly Atthis, a wonderful woman of Lebos Island, favorite of the lyric poet Sappho. Always in the Greek mythology there was also another character whose name was Atthis and he was a very beautiful young Indian, son of Limnaee, a nymph of the river Ganges. 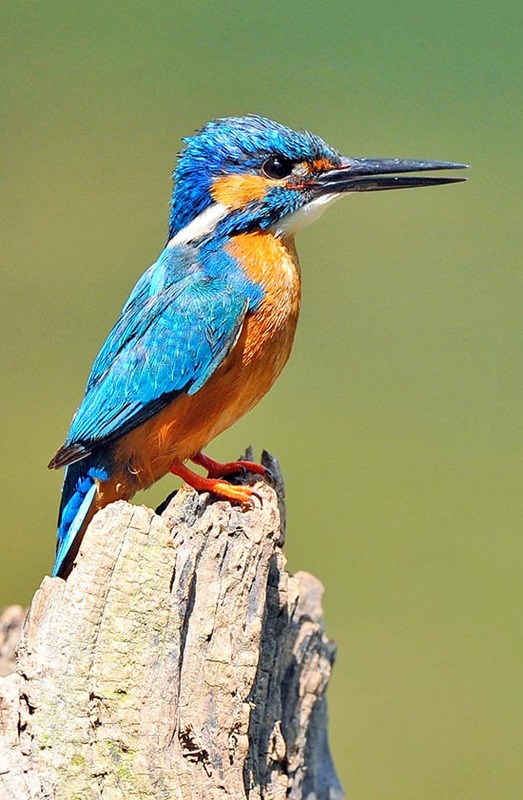 In Europe, the kingfisher is called Common kingfisher in English; Eisvogel in German; Martin-pêcheur d’Europe in French; Martín pescador común or Alción in Spanish; Guarda rios comum or Pica-peixe in Portuguese and Martin pescatore in Italian. The reason why the name Martin is so much diffused in the European languages appears having been originated by an old French tradition that indicated this bird as a friend of Saint Martin of Tours, and therefore it has remained linked to this name. In the old Italian jargon, this bird was called also Saint Mary’s bird, with clear reference to the light blue that imitates the colour of the tunic with which is usually represented Our Lady in the ecclesiastical iconography. The kingfisher has a fairly vast diffusion area covering almost totally Europe and Asia. It also lives in northern Africa along the Mediterranean coasts and along the Nile fluvial axis whilst is missing in the Scandinavian Peninsula, in Iceland and in the coldest regions of Russia. In Asia it is present in the Middle East, in the Persian Gulf and in the temperate belt up to Japan. Also the Indian subcontinent and the Malay and Indonesian areas are its strong pillars. The kingfisher is often sedentary in the mild areas not subject to severe frosts whilst is a strong migrant for those of central Asia and continental Europe. These populations may cover even 3.000 km to reach the hibernation areas that may be in North Africa for the European ones and tropical Asia for the Asian ones, zones where there is an overlapping of the different populations. It is a nocturnal and solitary migrant. Seven subspecies have been identified, mainly linked to the colour of the livery, the size and the inhabited areals. For the kingfisher the choice of the ideal habitat is a matter of survival as it hardly adapts to different ambients: it chooses locations with running water, clear, rich of fishes and insects and with steep and clayey embankments and well covered by vegetation. The reason is simple, the standing water, though being a frequented location, must be abandoned when the first cold weather arrives, as the surface begins to freeze whilst the current water gives him the possibility of continuing longer in the winter season. In fact, it is not rare to see kingfishers also in periods with very reduced temperatures, as it is sufficient to be able to have available not frozen surfaces. Clear and transparent because its hunting is based on the possibility of seeing under the surface the small fishes and the insects it nourishes of. The richness of preys is very important either for their survival but also for sustaining the numerous progeny that is produced every year. Finally, the steep embankments with banks of earth and of dried mud, sites suitable for its particular nidification. It is therefore found along the rivers, lakes, small ponds, springs and swamps with resurgence water. It adapts, however, also to mangroves and reed thickets but also to artificial basins, to the quarries and in some seasons, also to the small lakes marinas. 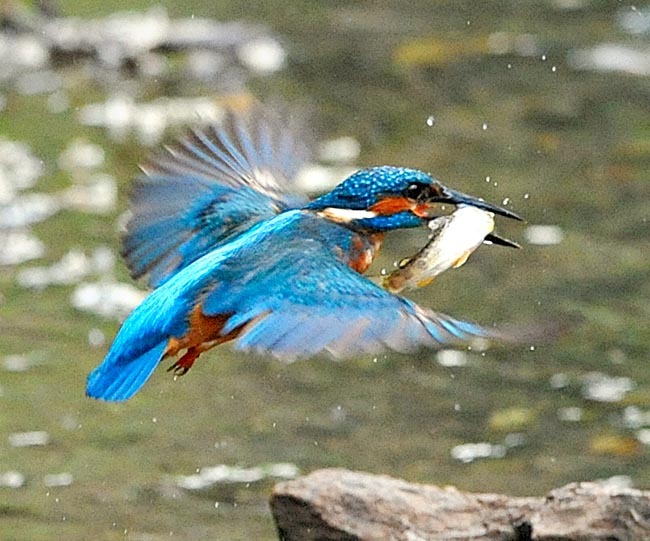 The kingfisher mainly nourishes of small fishes, chosen in the size depending on the necessity. Rather big for feeding or for giving the partner but very small and then increasingly bigger when necessary to feed the chicks in the nest. It catches also frogs, newts and larvae of insects, in particular the dragonflies ones it greatly loves. The hunting methods are extremely refined and practiced with the highest precision so much to guarantee almost the infallibility to each hit. Usually it takes place on small branches protruding over the surface of the water and waits for the prey to transit in its range. At times it does also the Holy Spirit, remaining suspended in midair for a few instants, the time sufficient for verifying the presence of possible preys. It calculates the depth, the size of the victim, the deviation of the image due to the water refraction and then with a breathtaking dive at full speed, here it is violently entering the water and gripping the prey. It usually dives from a few meters of height but often the water into which it dives has a such reduced depth to lead to think to a havoc of the poor little bird. If we calculate the impact at not least of 30 km/h we cannot understand how it may cushion the blow in less than 10 cm of water. And yet, the splash is violent but the kingfisher gets always out alive with its prey in the beak. Once back to the starting point, the killing operations of the prey begin, with violent slammings of the animal always firmly held in the beak, against the supporting branch. This operation, especially with large fishes, may also involve a discreet removal of the scales of the prey or the breaking of the carapace if it’s matter of small crustaceans. Usually when in phase of feeding the chicks, it prefers to take to the nest small tadpoles or soft larvae of insect, passing then during the growth of the progeny, to bigger and most important preys. While seeing a kingfisher with the fish in the beak it is easy to understand the destination of the meal. If kept by the head means that the prey will be consumed by the hunter itself, if by the tail it will be on the contrary used to feed the chicks of to be a gift to the female, during the courting. The kingfisher is a solitary and silent bird and strongly territorial, especially during the nidification, contrasting every invader. It becomes so also afterwards, expelling from its territory even the father or mother partner of the sons and the progeny itself. 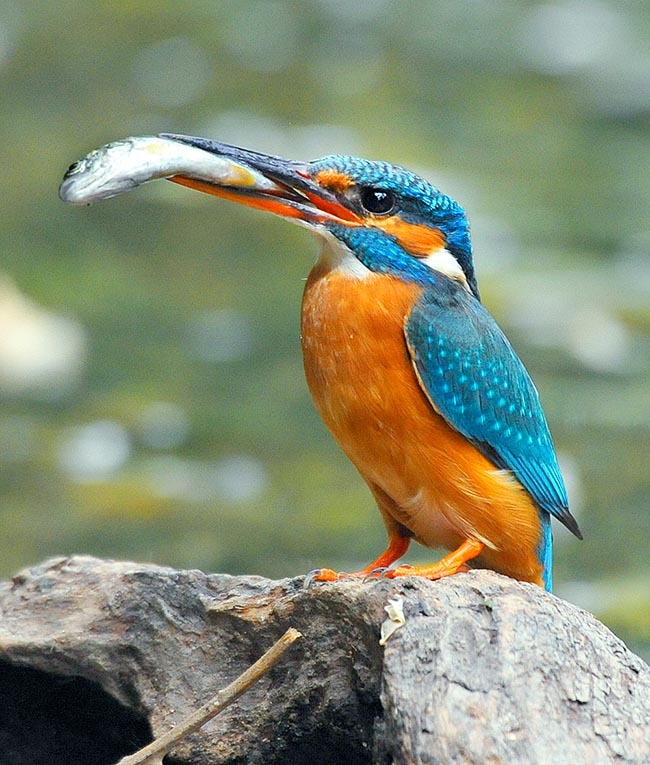 The diurnal activity of the kingfisher is dedicated almost completely to the seizing of prey, as its body requires a daily quantity of food equal to about the 60% of its weight. Even more for the kids who, in phase of growth, are capable to gulp down daily a quantity equal to their own body weight. Adults and chicks regularly regurgitate wads containing non-digestible parts and exoskeletons of the prey. The kingfisher is a small bird a few cm long, at most 17, of which about 5 or 6 of the only beak, having a wingspan of 25 cm and a weight of about 30 g. It has a squat and solid shape, as if it had no neck, seen that the head, rather big if compared to the overall dimensions, is well embedded in the trunk. It has not an evident tail and, disproportionately to its size, an immense beak. Two big and round eyes, rather prominent and very black. The colour of the upper parts of the body are of a shining turquoise light blue, with slight blackish spotting that on the head forms like darker blue small waves. The overtail is of an even more lively turquoise, rightly similar to the colour used to represent Our Lady in the sacred paintings. Cheeks and throat are white whilst all the chest is of a magnificent orange ochreous colour. The legs are bright orange, very short and almost invisible when flying. The sexes are perfectly similar, with as only distinction the lower jaw of the beak that in the female is orange whilst is black in the male. The young have duller and speckled colours but will adopt the adults’ livery before the completion of the first year. During the first months of spring the bodies of water resonate the hiss of these birds that chasing frantically on the water, try to conquer female and territory of nidification. Being fairly territorial, the struggles are harsh and continuous and lead to the creation of nidification areas away each other of even one km. In these phases, it is often seen the male offering the female a just caught small fish as act of consolidation of the couple. Accepted the gift, the game is over. The nest is a deep hole dug inside the embankment for a depth that reaches, as an average, the 90 cm, at the bottom of which is formed a round cavity where the eggs will be laid. The tunnel is dug slightly rising in way that accidental water infiltrations of the ground may drain out. The tunnel is dug by both partners, but mainly by the male, with the female that perfects the final opus. It is interesting to note the behavior kept by the birds during this period. As soon as an excavation shift, the kingfisher gets out from the den and dives immediately into the water to wipe its mud. Same procedure is applied every time one of the partners gets out from the passage while feeding the chicks. Actually, this bird is extremely clean and attentive to its magnificent livery. Two annual broods are done and very rarely a third done may happen if the season is very fruitful and abundant. Usually are laid 5 to 10 eggs and part of the brood is abandoned in the nest due to the material impossibility to cover the whole brood during the hatching. The eggs are very white and glossy, of a fairly roundish shape. The couples are stable only during the nidification year whilst change inevitably from year to year. The hatching is done by both parents and lasts about 22 days and the chicks will take 4 weeks more before leaving the nest and become autonomous. The same nest is often used for the broods of the year but exceptionally also for the following years. 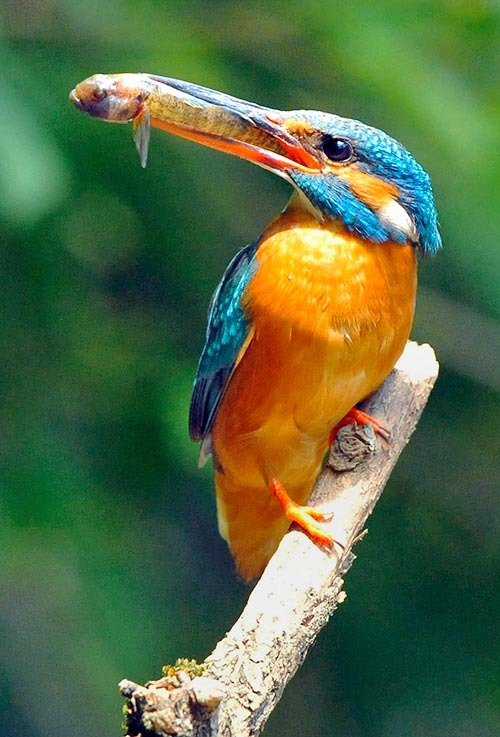 The kingfisher is a delicate but robust bird and with a much resistant body structure. It can stay a couple of days without eating but must have the promptness of leaving the places frequented before that the surface of the waters may suddenly freeze rendering impossible the obtaining of the food. The choice to move must therefore be taken before that the small bird weakens so much to be unable to undertake long journeys. In fact, this is the main cause of the death of the still inexperienced young. It is rather long-lived and may reach the age of 20 years even if in the wild the average life does not exceed the 10.